WARNING: The following contains spoilers for season 2 of Marvel’s The Punisher. Read at your own risk! When production wrapped on the second season of The Punisher last August, the Marvel-Netflix universe had been robust, with five separate shows and a miniseries under its belt. But in the months since, three of the original street-level Defenders series have been canceled, with The Punisher and Jessica Jones as the remaining series with new seasons left to air. On Friday, The Punisher dropped its latest batch of episodes, with its future still unknown. Below, executive producers Steve Lightfoot and Jeph Loeb (the latter of whom also serves as the head of Marvel TV) address the possibility of a third season and delve into the making of season 2. ENTERTAINMENT WEEKLY: Let’s start with crafting this season as a whole. What were the inspirations behind some of the adventures you took Frank Castle [Jon Bernthal] on in the beginning, away from New York? STEVE LIGHTFOOT: Frank always felt like a very Western hero to me, so it was fun to go out and do that. [Episode 3] had an inspiration in Assault on Precinct 13, also Rio Bravo and those sort of Howard Hawks Westerns. His dynamic with Amy [Giorgia Whigham] anchors his arc this season, aside from the Billy Russo [Ben Barnes] storyline. What went into creating that character and expanding on her from the comics? LIGHTFOOT: The one thing with Frank for me was, he couldn’t just be dealing with the grief of his wife again for a full season. That was never going to go away, but we needed to find a new driver for him. And the other thing with Frank is, you have to give him a reason to fight. It’s always about, “Who do you put around him, and who is he fighting for?” I loved the idea of putting him with a young girl and seeing what that dynamic did for him. Ben said he didn’t know at the top of the season that Billy would die by the end. Why did you decide while making the season that he had to go? LIGHTFOOT: It’s kind of where the story took us. It just felt wrong for Frank that he would let him get away again. I just said, “Given everything we’ve built up about Frank, what version of events would let him leave Billy alive again?” I could never find one, and it was driven from that. LOEB: We had lots of talks about whether it was going to be a big shootout, a big action set-piece, and Steve came in with the idea that it should just be this cold, almost in many ways insignificant moment, and the idea that it would be in the basement of a building, with a guy who probably would have bled out even if Frank didn’t do anything. It’s just a really harsh indifference. You get caught off guard by it. LIGHTFOOT: Something else was that we also realized Billy was just as much Dinah’s [played by Amber Rose Revah] nemesis. As we got into it, it just felt like we would be really denying her something if she didn’t get to have her showdown with him. In essence, her whole thing has been, “I never got to look this guy in the eye, and he’d know I beat him.” In the end, the big shootout ends up with her rather than with Frank. 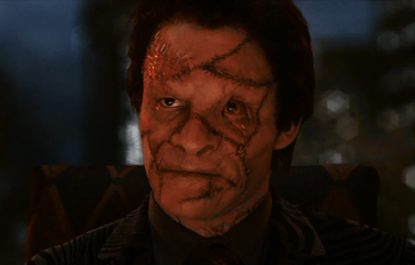 Jigsaw’s face isn’t nearly as torn up as it is in the comics or in the Punisher: War Zone version, when he was played by Dominic West. Why the decision to give him such good plastic surgery, if you will? LIGHTFOOT: We were quite surgical about it, pardon the pun. [Laughs] If you take into account modern medicine, the way the wounds have healed are really realistic to everything he got in season 1. The basis was to keep it real, and generally we try to stay grounded. The action is over-the-top and should be, but we’re trying to stay grounded in detail. The other thing is I think Ben’s an amazing actor, and if we put him under a complete prosthetic, we’d have taken away an awful lot of his game. We have to talk about this series’ future. Given how three out of four original Defenders shows have now been canceled, what can you say at this point about the likelihood of The Punisher, a spin-off of the flagship series Daredevil, returning for a third season? LOEB: We would love that, and nothing would make us happier than to work with those talented writers and crew. As I have repeatedly said, it is not our decision. We are ready to go and would love to do so. It is Netflix’s call to make. It’s been reported that the decisions to cancel those shows came as a surprise, after writers’ rooms had already been assembled. Was that really case for all three? LOEB: I’d rather not get into the specifics, other than we were and continue to be extremely disappointed by the decision that the network made. But when you’re in the game, that’s all you can do. Everyone has a favorite television show that has been canceled on every single network, and we just happen to be at that place right now. If there is a third season, what would you want to explore? LOEB: We have a whole story in mind that would be awesome, but again, the guns are locked and loaded, but Netflix has the finger on the trigger. LIGHTFOOT: We were finished before any of this started happening. I left [season 2] on that final shot that was just meant to [make people go], “Wow, I can’t wait to see season 3.” That was it. That was what I want them to take away, and it’s like any show — if you’ve been in this business long enough, we’ve all worked on shows that got canceled that you wish hadn’t. I just hope we made a great show.… My philosophy is always make every season like it could be your last. Don’t save anything for next season, even if that means you’ve painted yourself into a corner. But make every season the best it can be, and hopefully it speaks for itself. The Punisher season 2 is now streaming on Netflix.